Noble Noctowl! Pokemon One a Day, Series 2! As I mentioned yesterday, I'm a fan of owls and already knew from the get go that I would go realistic for Noctowl to juxtapose the cartoony illustration of Hoothoot. This guy took as long as Feraligatr to complete, and was a blast to work on. Style wise, it's the first of this gen, while Feraligatr is more cartoony in nature with realistic detailing, this piece was meant to be approached with realism in form and function. This was one of those illustrations where I dove right in. No need to think up ideas or figure out a style or anything. I knew I was going to reference the horned owl and use a reference shot as a base to build upon. I converted some of the real creature's details to my Noctowl's, specifically extra coloring patterns and the tufts of fluff around the face in black and white/cream. I disguised Noctowl's cartoony triangular markings into the realistic version by concentrating black dashes on its chest to loosely create the geometric shape to appear more natural than otherwise. I also kept Noctowl's pointy tail and red irises, but leaving behind the white eyeballs for a more menacing yellow. 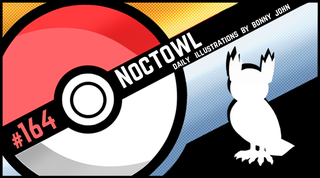 The one detail that I went back and forth on was whether or not to play up the roundness of the original Noctowl. Oh, and the fact that for whatever damn reason, Nintendo/GameFreak made Noctowl FIVE FREAKIN FEET TALL. WHAT IN THE ACTUAL EFF!? I decided to scrap that and made it a more reasonable size and minimized the round head and leaned the body out a bit to make it look more adolescent than juvenile which is what it looked like in early stages. What real world bird would you want to see incorporated as a design for a future installment? If possible, give it a name, a typing, and describe it! P.S. 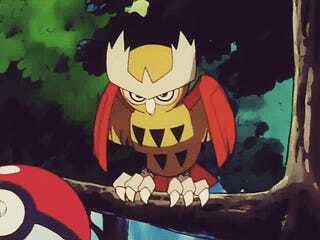 All I could find were gifs of Ash's shiny Noctowl. I had one too; it was my second shiny in Pokemon Silver. My first shiny was also from that game, and will be revealed when we get to that creature in the countdown. Who could it be?! Pidgey! Pokemon One a Day!